It’s not every day you have the chance to visit a Unesco World Heritage Site! RB and I took the chance to spend an afternoon in Kinderdijk visiting the Mill Network when my parents were visiting in October. According to the Kinderdijk website, the Mill Network is accessible on the #90 bus departing from Utrecht Central Station or Rotterdam Zuidplein Station. Since getting there with public transit from our house would take over 2 hours, we decided to drive! Tickets to enter the site cost €7.50 per person, with proceeds supporting the maintenance costs. If you buy tickets online from their website, there’s a 10% discount. The site is beautiful and includes a walking/biking path along the water and through the windmills. 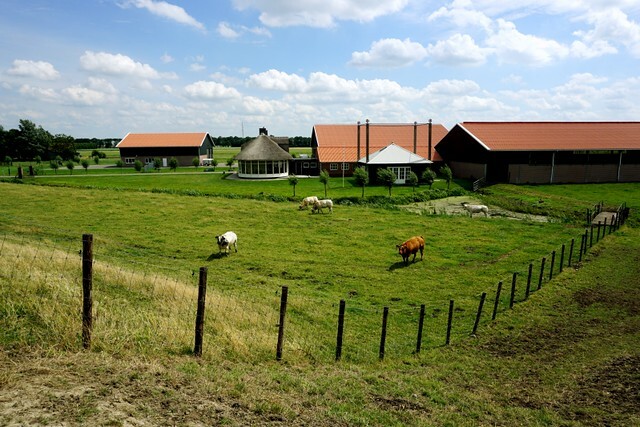 There are two Museum windmills on the site – Nederwaard and Blokwer. The Nederwaard windmill is in its original state and includes a history of how the Miller families lived. The museum also showed how the windmill worked. Of course I took about a million pictures of the mechanisms that run the mill, including these cool wooden gears! We didn’t visit the Blokweer museum, but I understand that it’s a more traditional museum geared towards children – you get clogs and overalls to wear on the tour! I also understand that there’s a much more in-depth view into how the mill works, and that the mechanisms have been made as visible as possible. This makes me wish that I’d gone in! I feel like Leiden is an underrated city. It’s not as well known as Amsterdam, Rotterdam or even Delft, but it’s one of my favourite cities in the Netherlands. 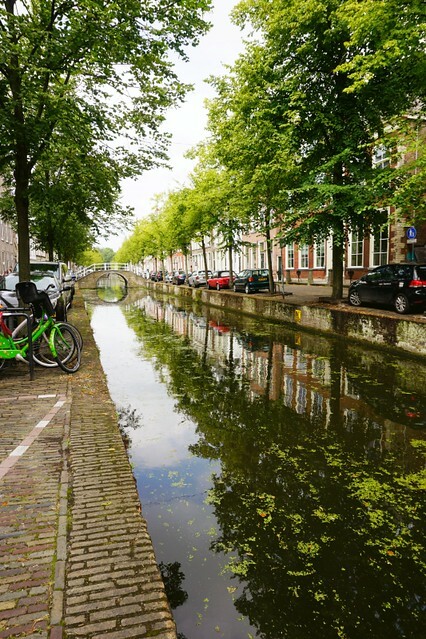 The canals, historical buildings, alleyways, and treasuries of knowledge, culture and science make Leiden definitely worth visiting. 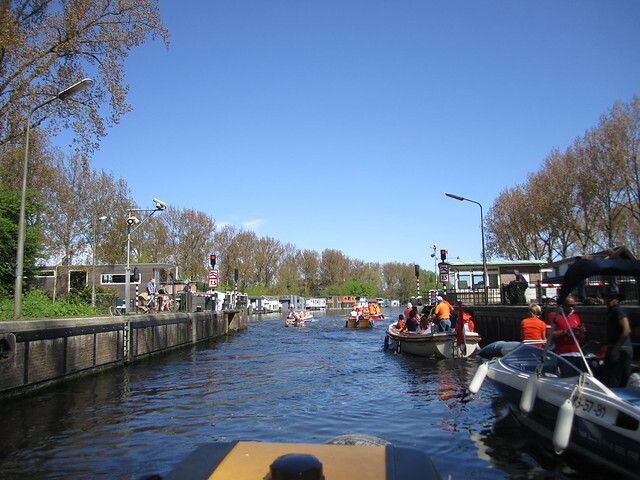 Leiden is very accessible from Amsterdam; there are frequent trains from Amsterdam Central Station to Leiden Central Station. 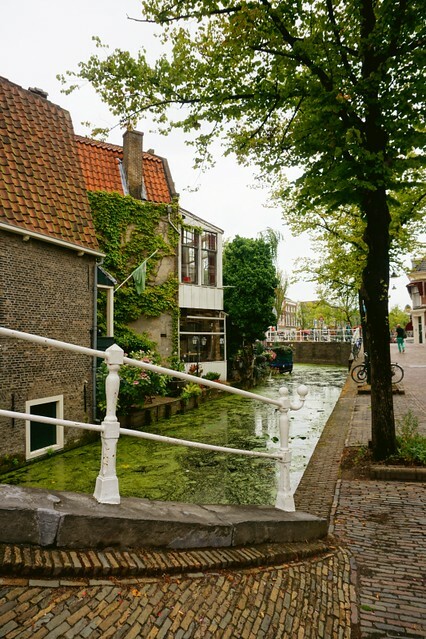 As I said in my post about our tour of Amsterdam, I prefer to see new cities with walking tours, and the city of Leiden has a fantastic self-guided tour: the Leidse Loper. It’s available from the Apple App store, and there’s a web-based version if you’re not an apple user. There’s also a paper version available from the VVV for €4,95. All are available in English and Dutch. I downloaded the App to try it out, and my phone vigorously notified me when we were approaching any of the locations, when we were at the locations and when we were leaving the locations. Each location on the tour had a plaque with some additional reading about the history. Our first stop was at the Heilige Geestweeshuis (Holy Ghost Orphanage), built in 1583. The size of the complex shows how many children were orphaned. They came from not only the surrounding areas, but from as far as Aachen and Liège, to learn a trade. 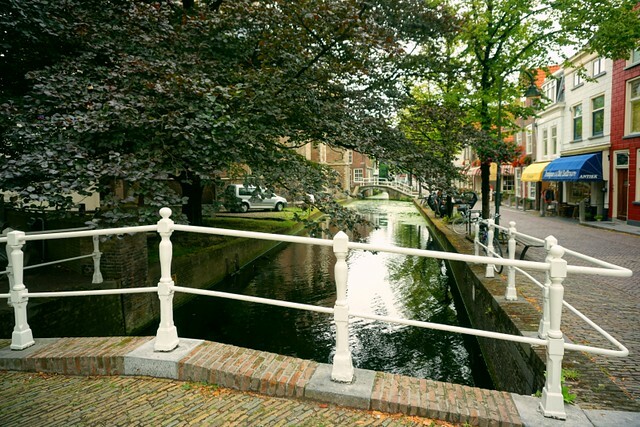 Leiden had a thriving textile industry, which had use for skilled workers. 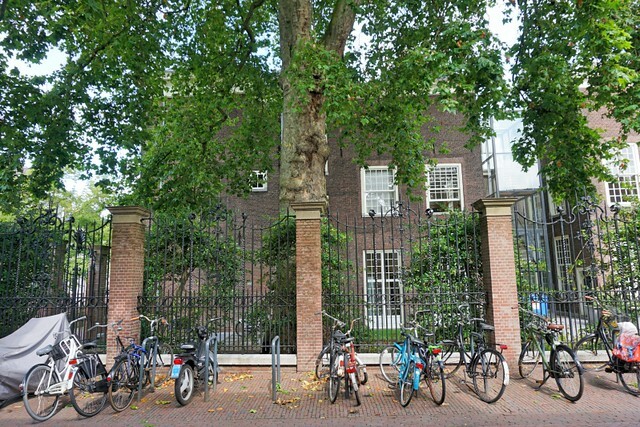 The complex now houses an organisation for children’s rights and the Archaeological Centre of the Leiden Municipality. 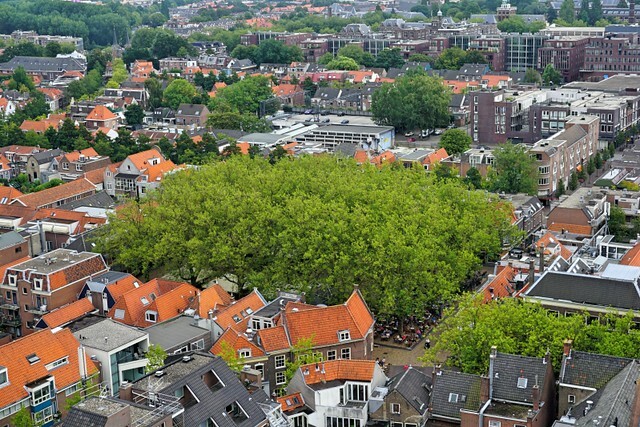 Our next stop was at Burcht, Leiden’s citadel, one of the city’s most distinctive monuments. The man-made mound on which the citadel stands dates from 1150, making it older than the city itself! The municipal council bought the mound and the building in 1651 and turned it into a town park. 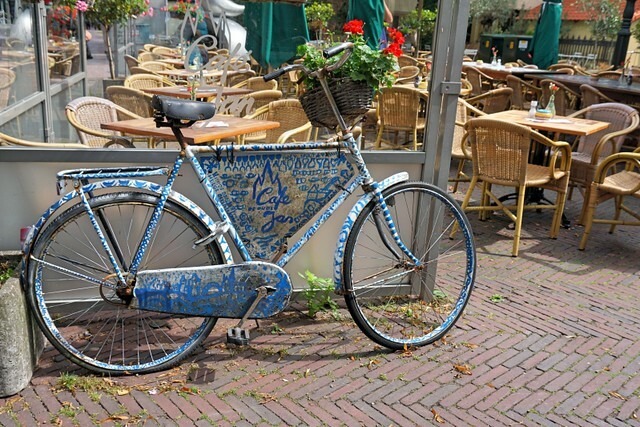 Leiden is known as the City of Keys and the keys motif can be seen all over the city. This dates back to 1293, when a city seal depicting Saint Peter holding a key was featured on official documents from the ‘stadt Leyde’. 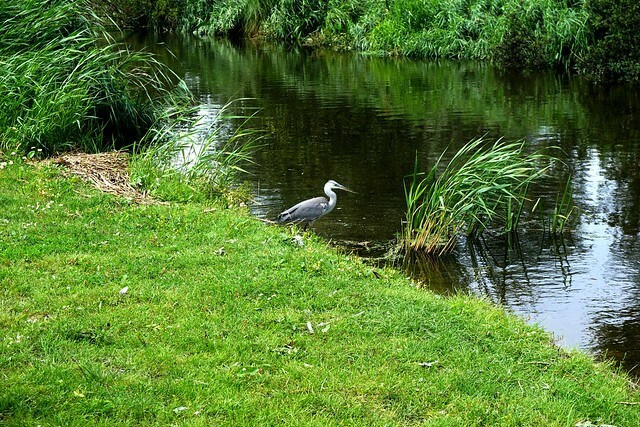 The Rapenburg canal was dug not long after 1200 to provide the still young city of Leiden with a strong defence. 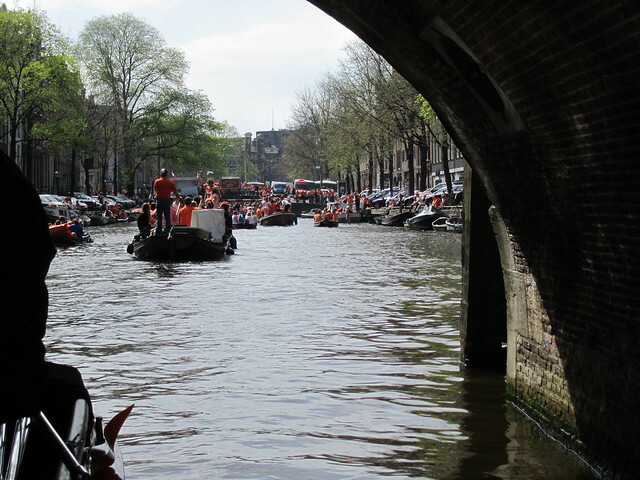 However, in the 17th century it became one of the most fashionable canals in the city! According to some 18th-century geographers, Rapenburg was the most beautiful spot on earth, and it’s not hard to see why! After our walking tour, RB, mom and I went for dinner at the most delicious Thai restaruant I think I’ve ever been to! If you’re in the area, I highly recommend Siri Thai! It’s small and gezellig, and you’ll definitely want to make a reservation to be sure there’s a spot for you. 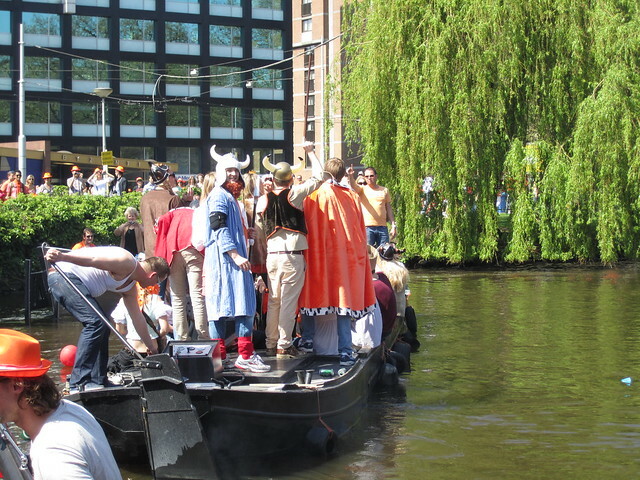 The 3 Oktober festival commemorates the anniversary of the relief from the Siege of Leiden during the Eighty Years’ War. 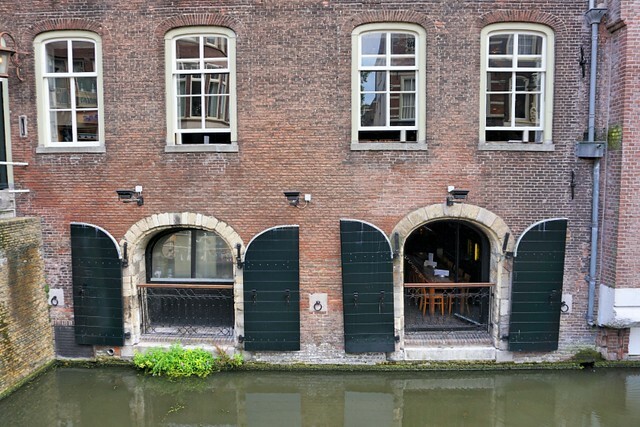 In 1573 the Leidenars were prepared for the siege; large supplies of food were stored within the city walls. Leiden withstood the siege without any issues, and when, in March 1574 the Spaniards suddenly withdrew, Leiden celebrated. Unfortunately for the Leidenars, the Spaniards returned in May – the siege had only been lifted temporarily. The supplies that had sustained Leiden during the first siege hadn’t been replenished, and soon provisions began to run out. During the siege, one-third of the population died and the rest were dangerously close to starvation. On the morning of October 3rd, the army of Watergeuzen led by William van Oranje, entered the city and fed the citizens herring and white bread, and Hutspot, a dish made of boiled and mashed potatoes, carrots, and onions. Leiden is the closest city to us, so I hopped on the bus to celebrate a friend’s birthday and to see what all the hoopla over 3 Oktober Festival was all about! The festival sort of reminded me of a bigger version of the Kermis in Roelofarendsveen. There was a huge midway, lots of live concerts going on at the bars in the downtown area, a parade, and lots and lots of people on the streets having a great time! 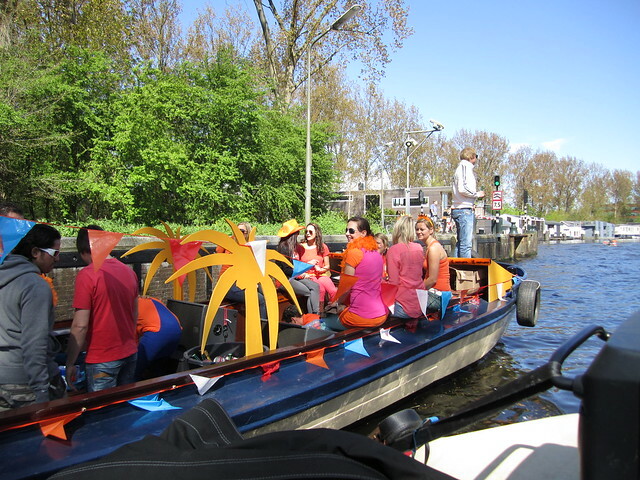 3 October festival in leiden! I was hoping that I could try some of the traditional meals, but the Hutspot was being served on Friday at dinner time and the herring was being served early on Saturday morning, neither of which worked for me. Plus, I needed to register on Thursday to partake! Maybe for next year’s 3 October Festival! Back when my parents were here, we decided it would be nice to visit some places nearby. And there’s no bigger or better-known city nearby than Amsterdam! We started our Day Trip Amsterdam at the Central Station, in the heart of the City. There are tonnes of trains travelling from Schiphol Airport to Amsterdam Centraal every hour; just make sure you jump on the right one! My mom and I agreed that we like to do a walking tour of any city to get a sense of how it’s laid out and a feel for its vibe. 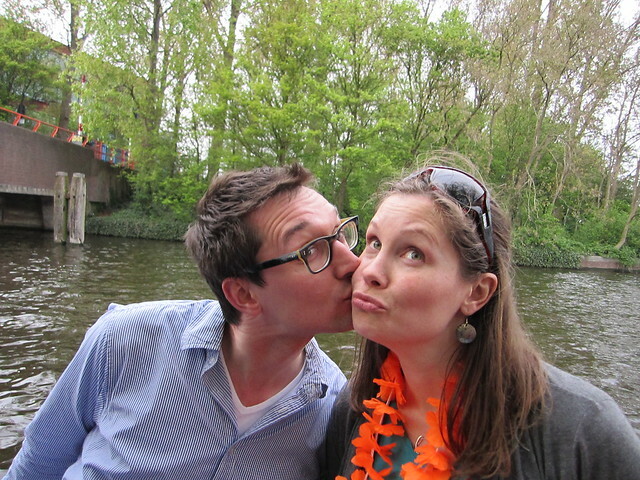 We signed up for the City Free Tour Amsterdam, and were not disappointed! The tour runs daily at 11:30 from the Beursplein beside a beautiful cafe where we used the bathrooms before heading out. Our guide, Kim, took us on a fabulous walk that included visits to some of the main landmarks in the city as well as bits of history about each place. If you’re considering taking this walking tour, you may want to know that we spent some time in the red light district. It’s an interesting part of the city and has some fascinating stories to go along with it, but know that you will likely see some scantily clad ladies in windows. The tour was supposed to be about 2 hours, but ours was a bit longer because of a family whose pace was a bit slower. Kim, our guide, was very accommodating and made sure we all enjoyed the tour. She let us know when the two hours had passed, and a few of the guests needed to leave because of other engagements. The tour is tip based, and the site recommends €10 per person. We agreed the tour was worth at least this, based on the job Kim did, especially considering most walking tours are closer to €20 per person! The tour ended in the Jordaan area of Amsterdam where there are tonnes of restaurant options from which to choose. Trip Advisor lists 153! After eating, we made our way to the Amsterdam Museum. This was one of the first places that RB and I visited together, and I remembered loving it! Mom and I walked through the Amsterdam DNA exhibition, which gives an overview of the history of Amsterdam. My favourite part was learning how the city infrastructure grew, and why the city is laid out as it is. The installation for each era includes a map showing what part of the city existed in white, and what part of the city grew during that period in grey. We also visited the Graffiti exhibition, which is the first in the Netherlands to be dedicated to New York and Amsterdam graffiti from the 80s. While it was interesting to learn about, my attention span at museums has an expiry, and we were getting close to it. While mom and I went back home for dinner and to hang out with RB, there are also about a million options for dinner right near the Amsterdam Museum. Well, actually, Trip Advisor lists 338 in the Grachtengordel area, but who’s counting? Do you have any favourite attractions or restaurants that are worth visit during a Day Trip Amsterdam? 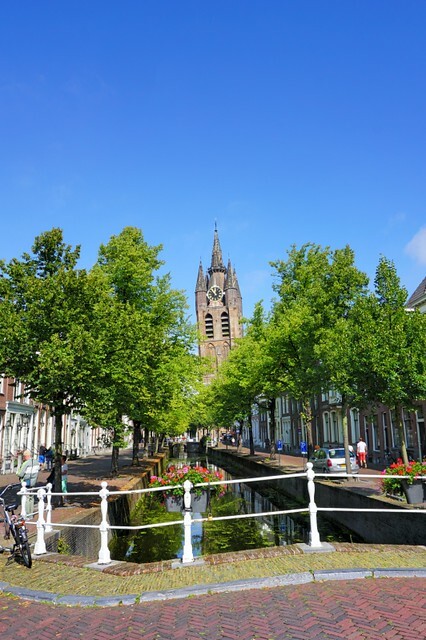 A few weeks ago, I had the pleasure of visiting the Dutch town of Delft. I had been thinking that I should be spending some of my free time exploring my new home, and the town where RB works seemed like a great place to start. First thing in the morning, RB took me to his work, showed me around his building and introduced me to his colleagues who weren’t on vacation. There weren’t many since it was August in the Netherlands! 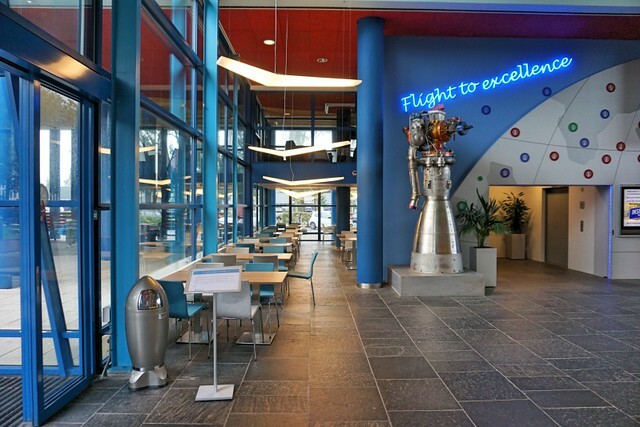 RB works at the TU Delft in the aerospace engineering department. It seemed everything in the building was related to flight, including the wing-shaped lighting fixtures and rocked shaped garbage cans! 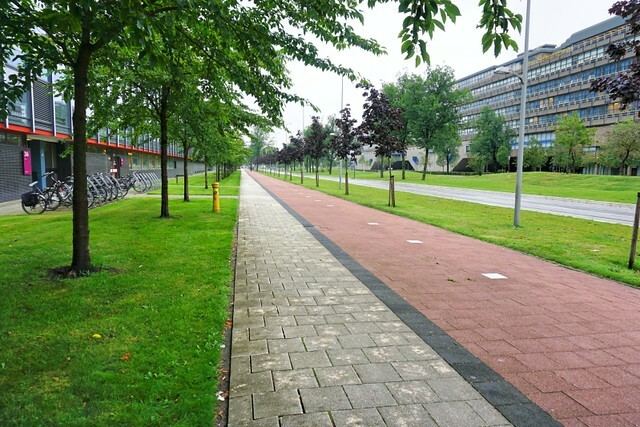 I walked along the main road through the TU Delft Campus (Mekelweg), which looks a lot like the main roads of other university campuses I’ve been to. I was very surprised at how busy it was seeing as school had not yet started. 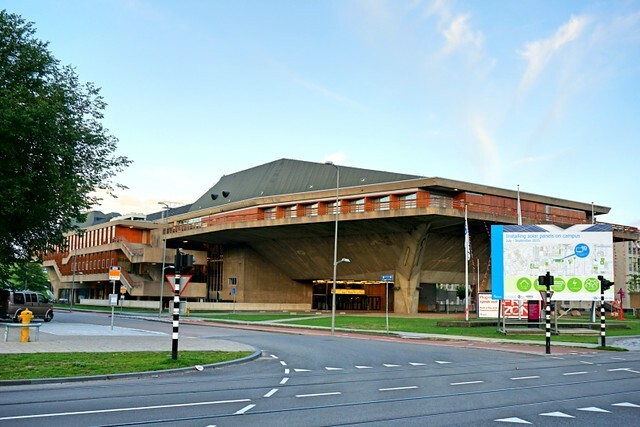 My favourite part of the campus (you’ll have to forgive me) is the Aula Congrescentrum, which RB had told me looked like the USS Enterprise from Star Trek. I was surprised to see just how much it does! Now if only there was a transporter in there to take me back to Canada at will. 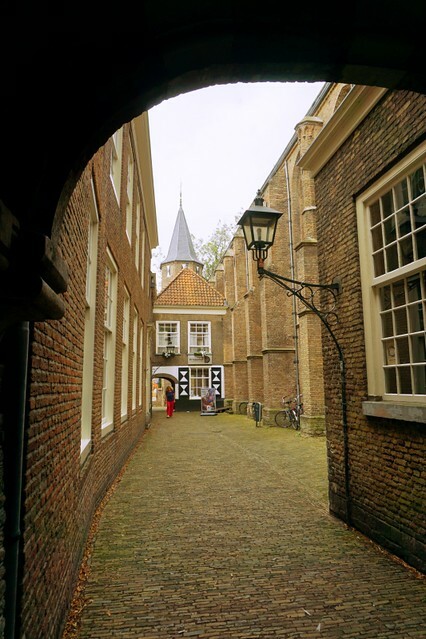 Once in the old town, I headed to the Delft tourist information point. I decided it was best to do an ‘official’ walking tour of the city, and picked up my Historic Walk through Delft guide book for € 3,75. The walk took me through all the important parts of the binnenstad (city centre), including city hall, the old and new churches, Burgwal, Beestmarkt, and Museum Prinsenhof. The tour had 3 add-ons that I chose not to walk based on time, but I understand from RB that they go through some interesting areas of Delft, so I might come back to try them! 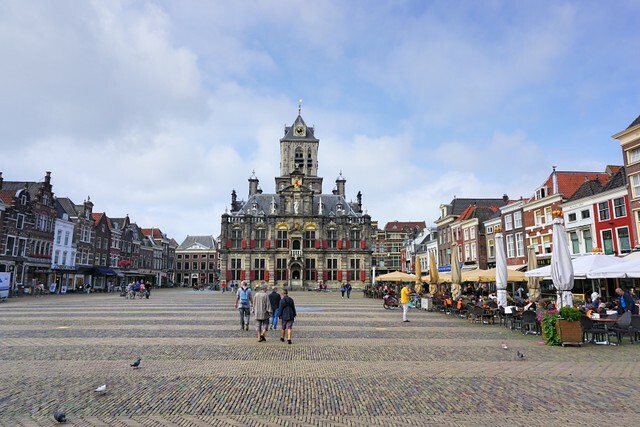 The tour started in the maket square, where the City Hall, the former seat of the city government, sits across from the Niewe Kerk (new Church). At first glance, the blackened top section looks like it could be fire damage, but that’s not the case. Bentheimer sandstone was used to build this section, and acid rain is the cause of the darkening. If you look at it from the side, like the slightly grainy picture below, you can see that the discolouration is worse on one side. This is because of the direction of the prevailing winds. Science at work! The tour took me past the Maria van Jesse church, the Roman-Catholic parish church in the city centre. I also walked along the Burgwal, a former canal with plenty of restaurants, cafes and shops. The Beestenmarkt (livestock market) was the site of the livestock market in Delft from 1595 to 1972. For about 20 years afterwards this space was used as a parking lot, but was converted to an entertainment centre. 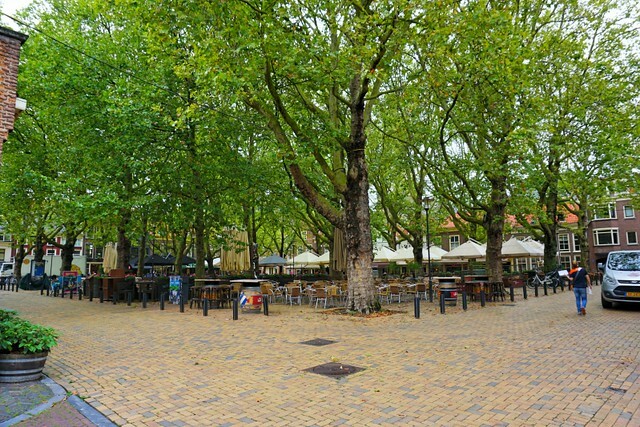 This square is surrounded by restaurants and cafés, and is a great place to sit and relax on their patios. 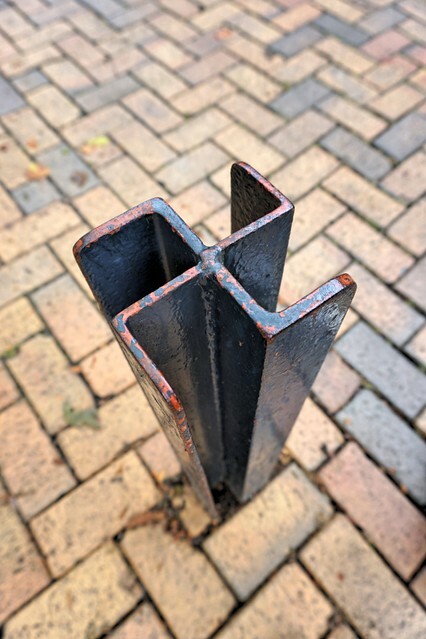 Along the east side of the Beestenmarkt there is a row of dark iron poles, which pay tribute to the former use of the square. These were used to construct wooden stalls to house pigs and sheep at the market. I walked along lots of beautiful canals and bridges! You can see how goods were delivered by canal to some of old buildings, which have been converted to restaurants. These all made me laugh and cringe at the same time – what happens if the water levels rise by more than 10 cm?! 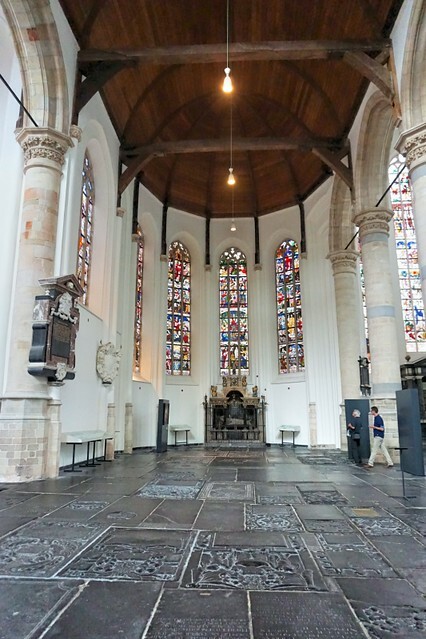 At last I arrived at the Oude Kerk (old church), and satisfied my curiosity of just how old it is! 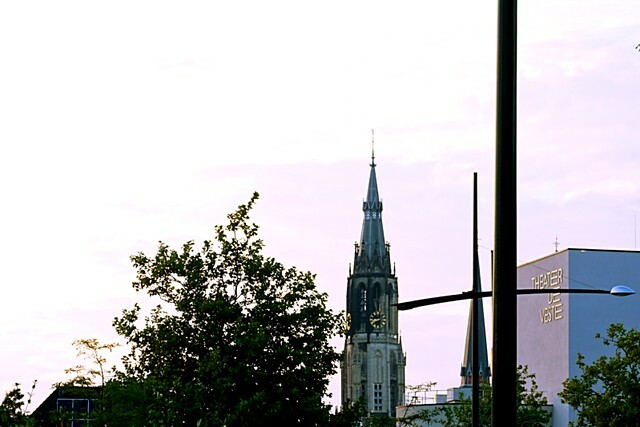 It was founded in 1246, with the central spire and four corner turrets added between 1325–50. The church stands directly on an old canal, which was filled in to make space for the church. The fill wasn’t stable enough to support the building and the church began to lean during construction. The builders managed to stabilize the foundations and carried on building, which is why there’s a kink in the tower! 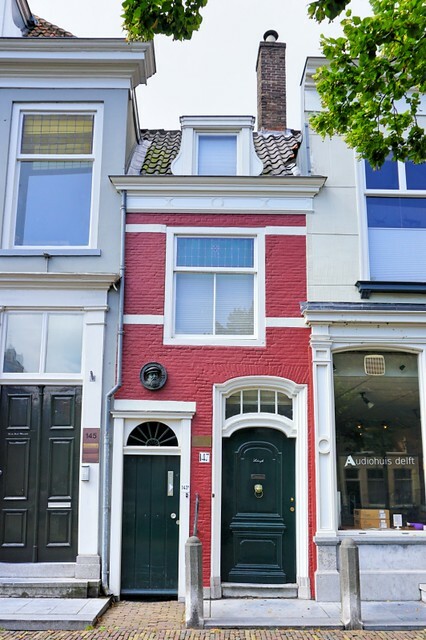 The smallest house in Delft was residence of the private Doctor of Prince Willem van Oranje. At this point in my tour, I stopped for lunch at the Cafe Oude Jan. 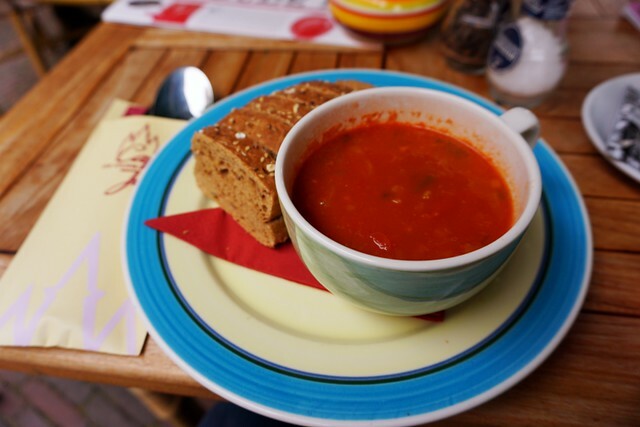 I had the tomato soup and a peppermint tea, and both were delicious and very reasonably priced! At this point in my walking tour I stopped in at the Princenhof Museum, which is open Tuesday to Sunday from 11 to 5. It costs €10, and I added the audio tour, which was an extra €2,50. I usually find adding an audio tour to be worth the price, and this was no exception! The museum has 3 foci: Willem van Oranje, Father of the Nation; Masters in Innovation, Delft creating history; and Delftware, the making of a global brand. I was particularly interested in the portion of Willem van Oranje, which discusses the formation of the Netherlands. 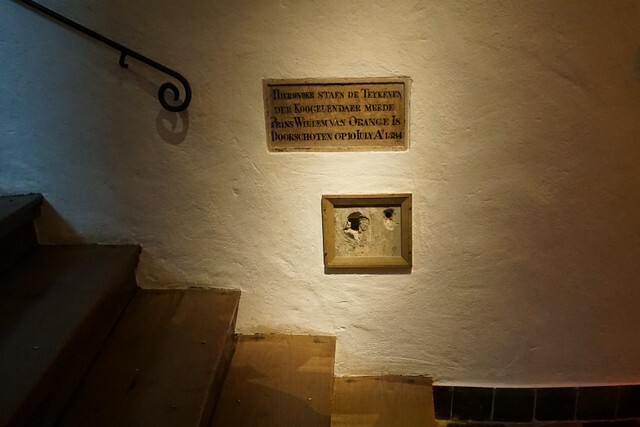 Willem van Oranje was assassinated at the location of the museum, a former monastery, and 2 of the 3 bullet holes are still visible. According to the audio tour from the museum, a forensic analysis was conducted to confirm the story of the assassination. It was determined that the gun was likely able to fire three times in close succession, kill the target and end up in the wall. 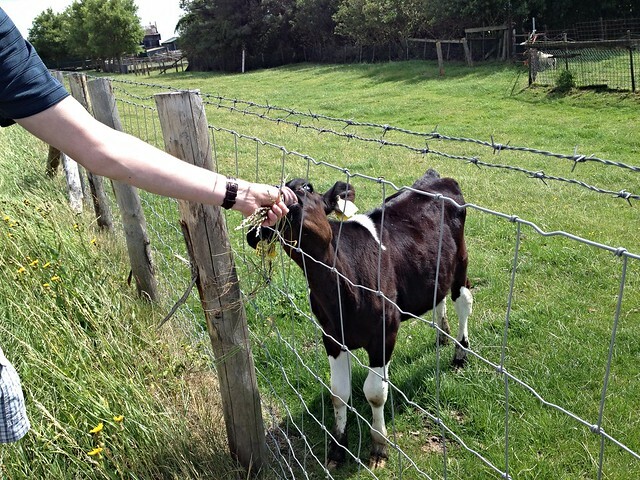 The audio tour also indicated that the holes are much bigger now because visitors keep putting their fingers in them! I opted to take a photo instead. Back on the walking tour, I found a fine example of crazy Dutch parallel parking. If I ever get my driver’s license (all about that in another post) you can bet that I will not be parking in any of these spots! I will be likely to either a) put my car into the canal or b) be so afraid of putting my car in the canal that my vehicle will still be in the way of passing traffic. No thanks! 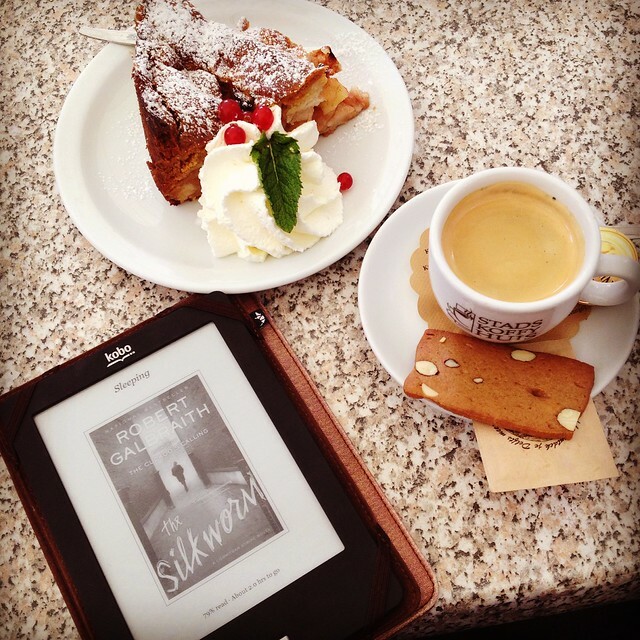 At this point in my tour, I stopped at a cafe where I had a coffee and apple pie while I waited for RB to meet me. 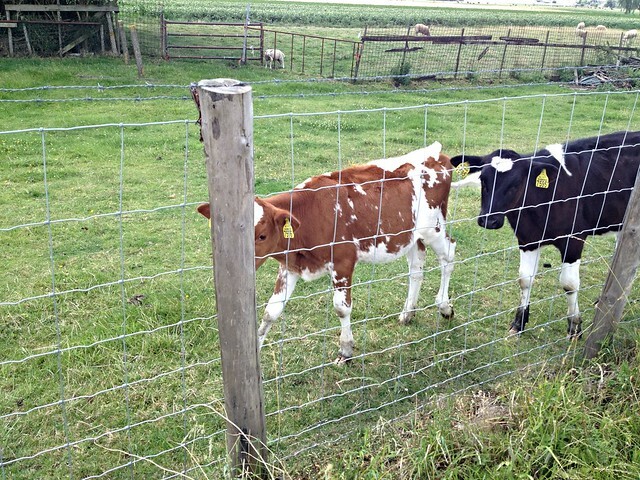 From there, we went into the Niewe and Oude Kerken for a visit. Each costs € 3.75 to visit, but you can do both for €6.50. 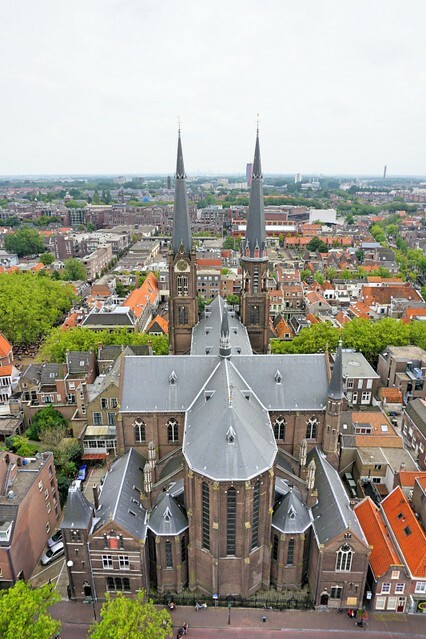 Included in that price is a trip up the stairs to the tower in the Niewe Kerk, which has 376 steps and reaches a height of 85 metres. Keep in mind that this was finished construction in 1496 and was probably not designed for tourists. The stairs are narrow and there isn’t much space to pass those going in the opposite direction. It was pretty full when we were there and there were a few moments where I wasn’t sure we would be able to make it! But we did, and it was worth it. 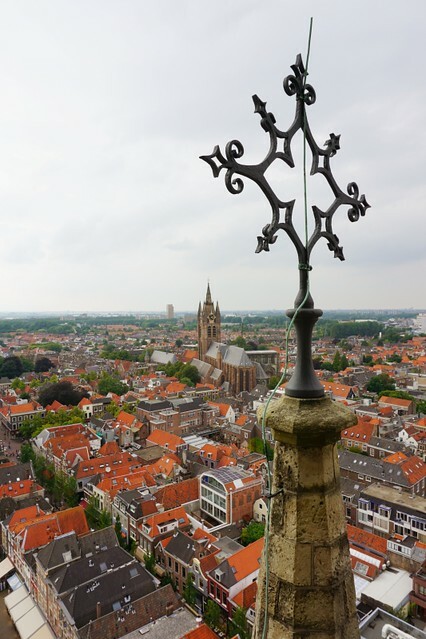 Despite some haziness, the view of Delft was incredible! The crypts in the Niewe kerk house almost every member of the Dutch royal family since Willem van Oranje, and are not open to the public. 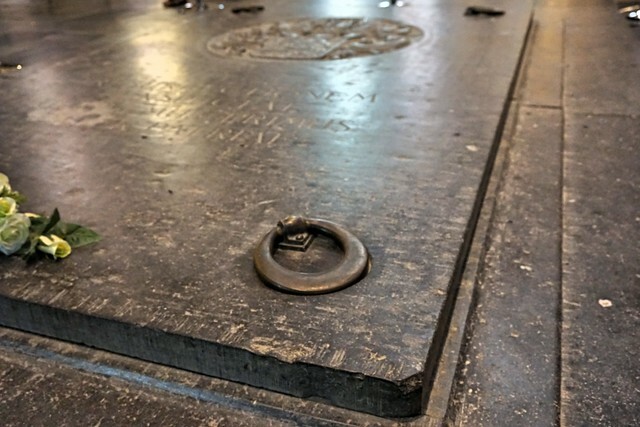 The most recent reconstruction of the crypts was the addition a heavy slab of natural stone at the entrance of the crypts, with four copper rings in the corners. The stone is etched with the Oranje-Nassau family coat of arms and the Latin inscription: ‘Here William I, Father of the Fatherland, awaits the resurrection’. 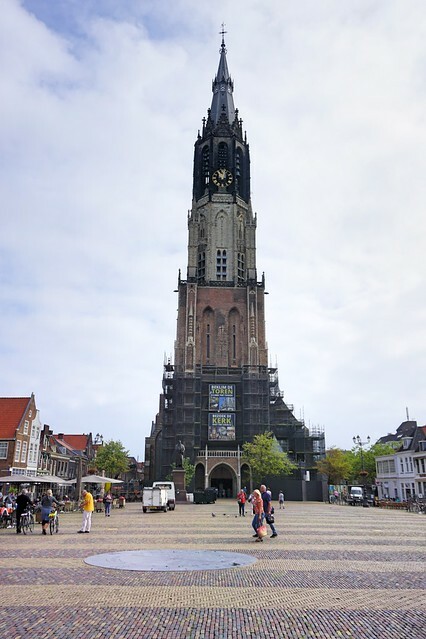 I thoroughly enjoyed my day in Delft, and I would recommend it as a day trip if you’re in the Amsterdam area and want to see something a bit different. I always assumed that getting around by public transportation was easy and cheap in Europe. And I wasn’t wrong! While the train, bus, metro and tram systems are all operated by different organizations, depending on the region, there are a few tools that make travelling between them all pretty easy! The first tool is the OV chipcard, which lets you travel on every single system! Coming from a place where this is not the case, it’s something I was extremely excited to learn! There are 3 types of OV chipcards – single use, anonymous and personal. Single use tickets are just as their name suggests – for a single use or return, assuming you’re travelling on the same day. Personal cards are also as their name suggests – they’re associated with a specific person and can be loaded with money for single trips or subscriptions. Anonymous cards are similar to the personal cards, but since they’re not associated with a specific person, money can’t be recovered from them if they are lost or stolen and if you forget to check out, you’re out of luck getting any money back. I have a personal card. They cost € 7,50 for the card, plus the amount you want to put on the card, and can be applied for online at the OV-chipcard website. To apply you need to have a photo and be able to pay with iDeal, meaning you need to have a Dutch bank account. Anonymous cards cost the same, and can be purchased at most ticket machines and offices. The system is a check-in-check-out system. 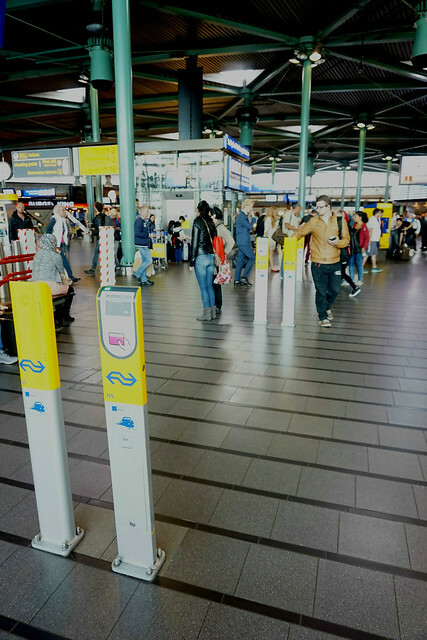 Checking in or out is easy – simply hold your OV-chipkaart against the screen of a card reader or gate. You’ll get a confirmation signal, including your balance, and the gate will open. If you need to transfer you’ll need to check out and then back in again. So, for example, when I travel to downtown Amsterdam, I check into the bus here in town, check out when I get off the bus, then back in when I go into the train station at the airport, then finally out at Amsterdam Centraal. The 2nd tool is 9292.nl. It’s available as a free app on the apple store or google play. 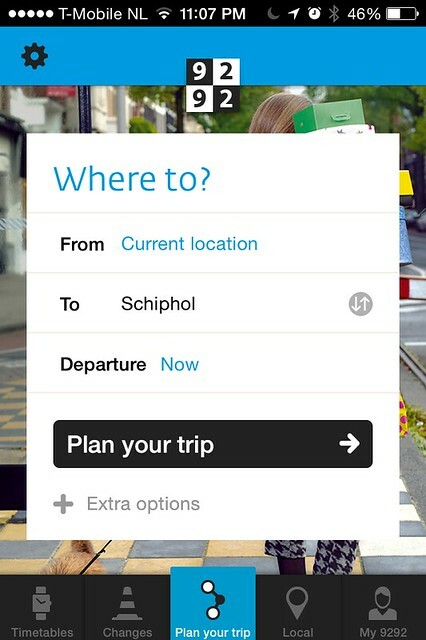 It’s a super user-friendly way of figuring out the best/quickest/soonest way to get where you want to go! As you would expect, you put in your destination and confirm your current location, and the app gives you all the options to get there, including walking directions. 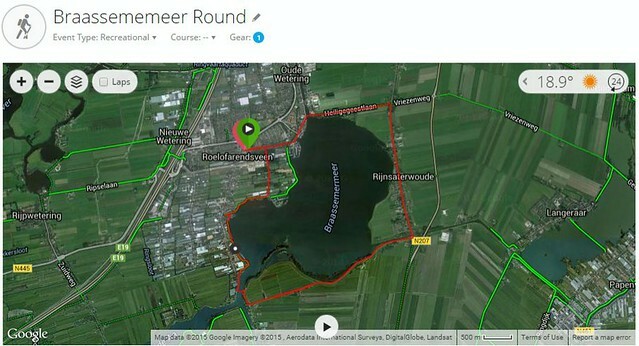 About a month ago, RB and I got ambitious and decided to walk around the Braassemermeer, a large (by Dutch standards) lake that we live super close to. The walk, which includes two ferries, is about 12km, but we walked over 13 since RB lost the €20 he had in his pocket when he took his phone out. 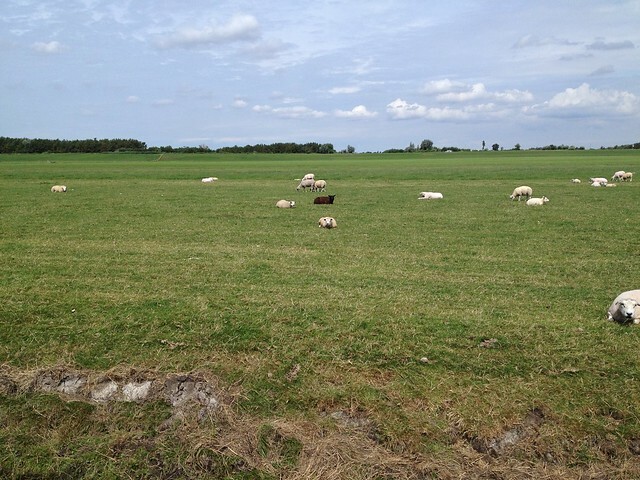 Pesonally, I think the sheep ate it! If would like to take this walk, get yourself to Schiphol Airport and take the 365 bus (towards Leiden) or get yourself to Leiden Centraal and take the 365 bus (towards Schiphol). 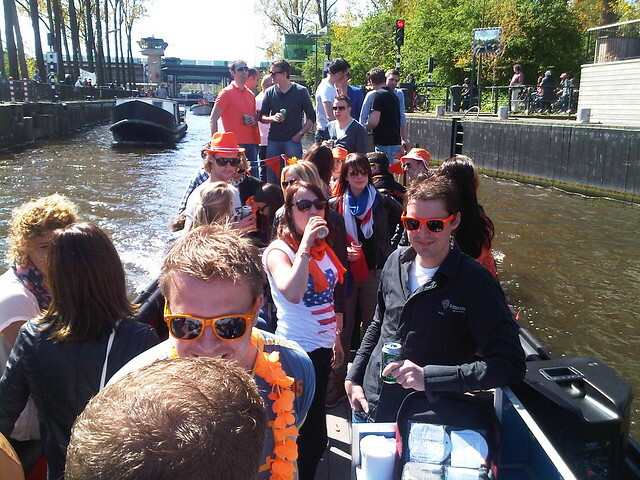 Get of at the Watergang stop in Oude Wetering. 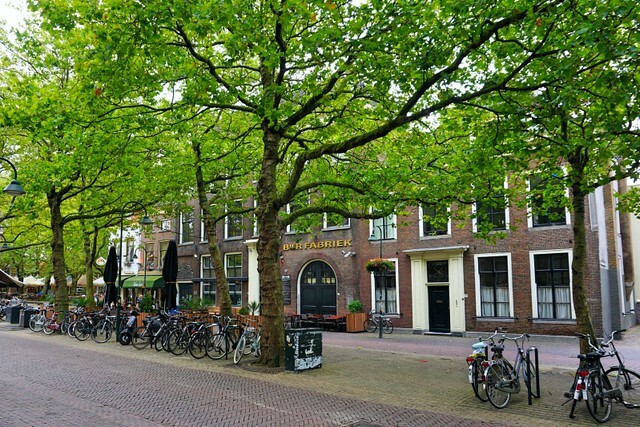 From there, walk east towards the oude wetering, then south along Kerkstraat. 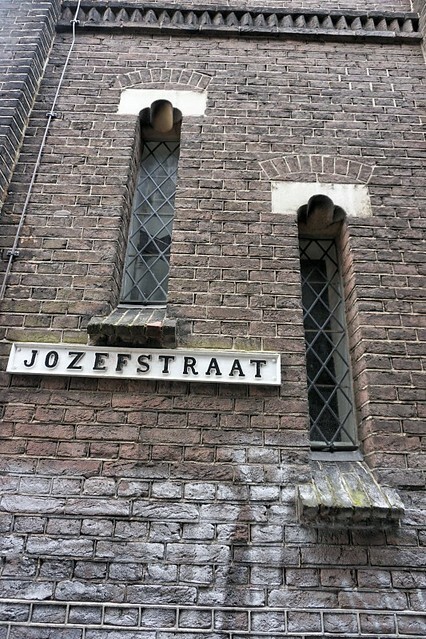 At the end of the Kerkstraat, you’re on the route! The ferry on your left is the 2nd one that RB and I took. The ferries cost less than 2€ each per person. 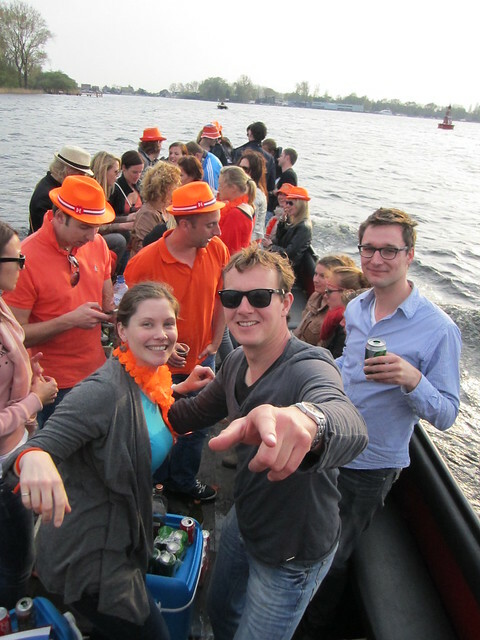 It’s a bit hard to believe that my first year living in the Netherlands and rather than participating in the Koningsdag festivities, I flew to Canada. Except that it’s for the birth of my first niece, and I couldn’t be more excited to be back for a nice long visit! 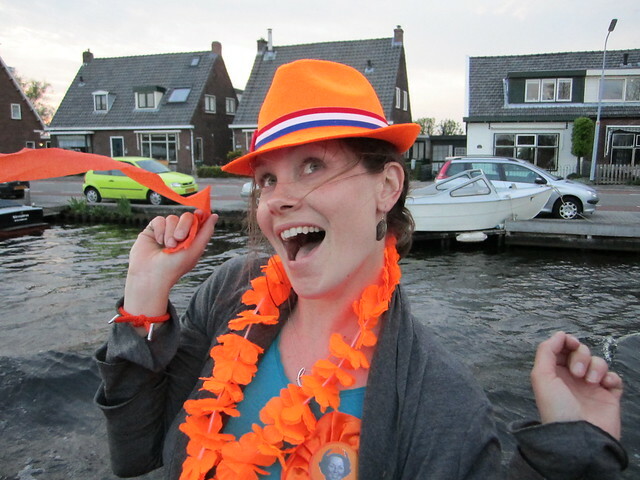 I also realized that I never shared my photos from 2012 when I was here for Koninginnedag, so I figured today would be the perfect day for that. 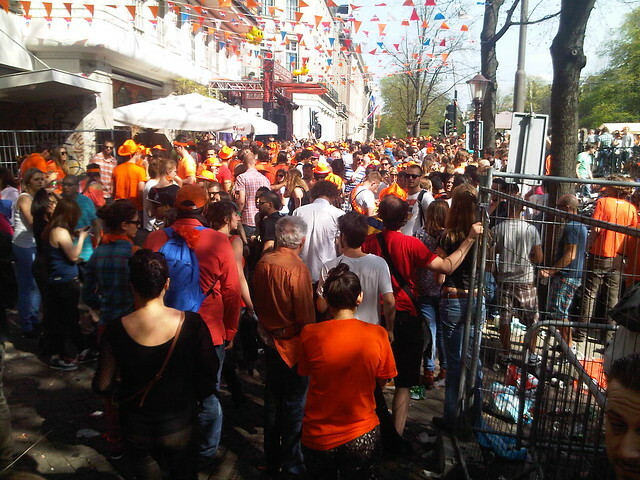 You may be wondering why I’m posting pictures of Koninginnedag rather than Koningsdag, and the reason is simple. 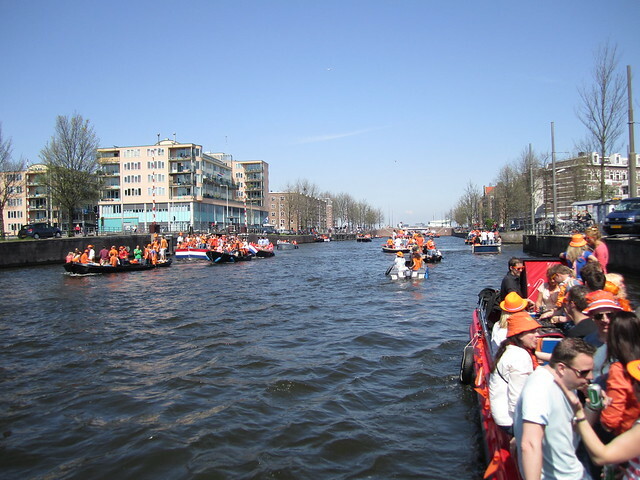 When I was here in 2012, Koningin (Queen) Beatrix was the monarch, and, as such Koninginnedag was celebrated. However, on April 30 2013 Queen Beatrix abdicated in favour of her son, the now Koning (King) Willem Alexander. 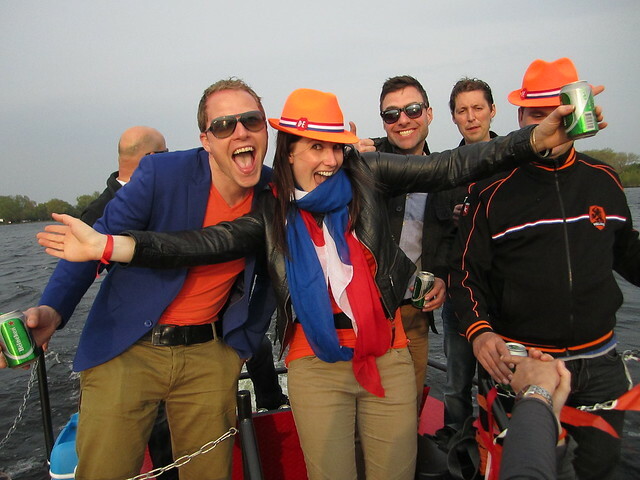 And since that date, Koningsdag is celebrated. 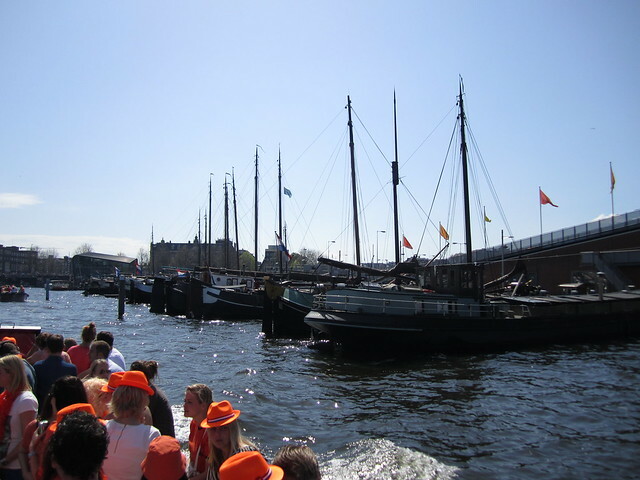 I had arrived in the Netherlands 2 days prior to Koninginnedag, and was suffering from jet lag, and was nervous to spend the whole day on a boat, and so had a quiet start to the day. We arrived at the harbour where we met everyone that would be there for the day. As we boarded, there were coolers with simple sandwiches for breakfast, which was just what I needed. 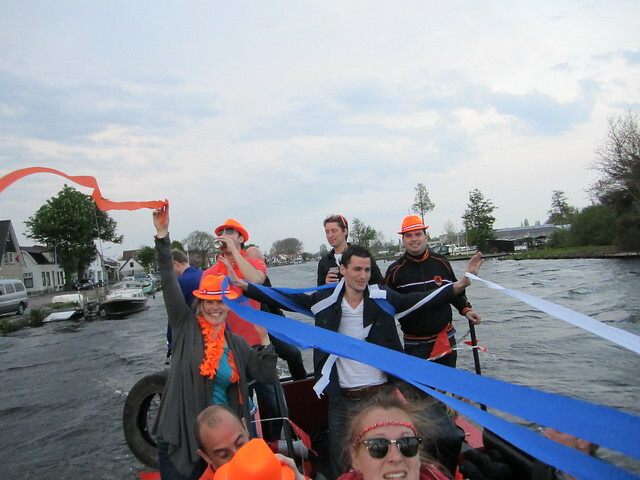 We made our way from the harbour through the Brassemmermeer and Westeindeplassen on our way to Amsterdam by boat. The closer we got to Amsterdam the more boats there were. All of these boats had sound systems and were blasting party music. I’m not a great videographer at the best of times, so put me on a boat and I’m totally useless! 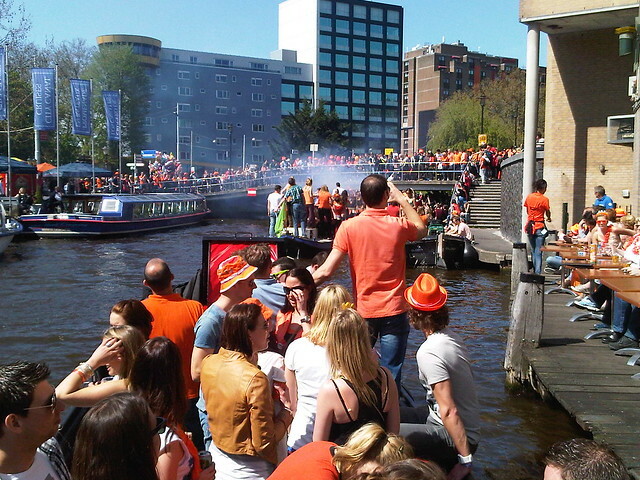 Literally everywhere you looked, there were people dressed in orange! Part way through the day we disembarked to make our way through the crowded streets. R and I got a hamburger for lunch, and found a ‘slightly’ quieter pub to sit down in. It was a heavenly haven from the craziness outside! Nearing the end of the day, we got back on the boat to head back to our town. Someone was smart enough to bring ribbons. Those things were beautiful! As we neared our town after the sun set, a familiar tune started to play. I was so excited I couldn’t wait for my camera to focus! It was a lovely day, and I can’t wait to celebrate it again soon! 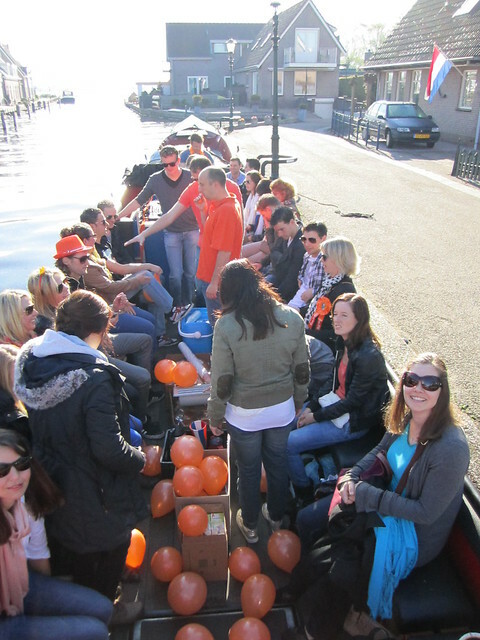 After a beautiful morning in Volendam, we got in the car to go to Haarlem. Unfortunately there was construction where three highways converge and we were caught in a massive traffic jam. The trip that should have taken us 30 minutes took us 2 hours! That meant that we missed going to the Molen (windmill) De Adriaan Museum like we planned. Instead we went into the city so that I could get some Sinterklaas and Swarte Piet figurines for some friends back home. My dad also wanted to go to the T-Mobile to ask about adding some funds to his German SIM card. One we got our errands done, we each had an oliebol with raisins. An oliebol is basically a large Dutchie doughnut. The name makes total sense, now that I think about it! It started to spit as we were ordering so we hid from the rain in one of the many community gardens, or hofjes, in Haarlem. Hofjes are gated community gardens surrounded by generally small houses. Although the gate for the one we found ourselves in was wide open, we seemed to be the only tourists in there. One the rain had stopped we walked around to see the front of the houses on the garden. The street was quite narrow and the houses were right on the sidewalk, as is typical here I find. 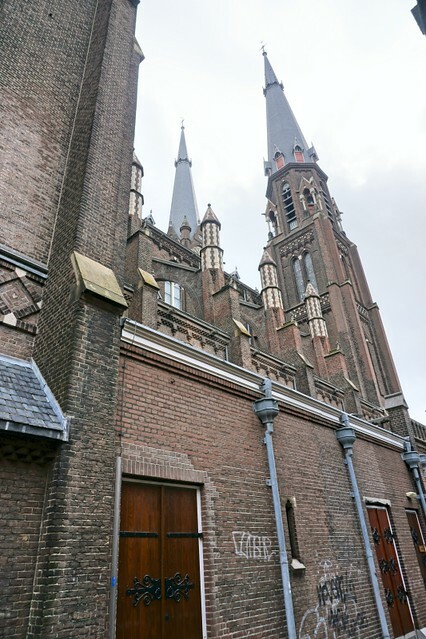 The street lead to the nieuwe kerkwe, or new church, which was built in 1649. 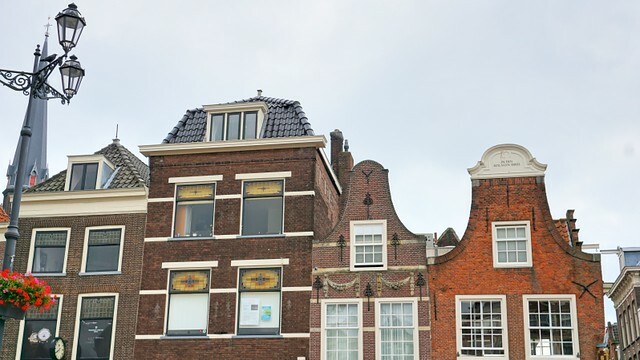 We continued our walk around some of the prettier streets of Haarlem. R took us to Groot Heiligland, which is the street where the Fran’s Halls museum is. R and I visited this museum on a previous trip to Haarlem, and it was wonderful. Though I’m not usually super keen about art museums, there was a free audio guide in a variety of languages (I went with English, R went with Dutch) that led us through some interesting stories behind the various paintings in the museum. That’s the kind of thing I find to be cool! From there we made our way to the middle of downtown and to the oude kerk, or old church, which was built in 1520. We looked for a nice bar or cafe where we could have a small drink before dinner, but R couldn’t find the kind of place he was looking for, so we went straight to the restaurant about 30 minutes before our reservation. Thankfully there was space for us. We had a beautiful meal at Erawan, which is the Thai restaurant R and I usually go to when we’re in Haarlem (and sometimes even when we’re not). The Thom Kha Kai soup is delicious! It rained quite heavily while we were eating, but thankfully it subsided by the time we were ready to leave. The parking garage where we parked had electric vehicle plug in stations, so naturally I made everyone wait while I took pictures! My dad joined in on the fun, and got better pictures than I did. Not surprising since his DSLR is significantly better than my point and shoot!